Career Services Resources Fair a big success! Congratulations and thanks to the 18 resource providers and over 40 provider participants who joined together on Friday, February 15 to share and learn about resources to help create stable housing through stable employment. Click here for the hand-out summarizing resources shared at the Fair and contact information. Special thanks to Representative Aaron Vega of Holyoke for being there and his steadfast support of our Network’s mission. And thanks to MassHire Holyoke for their generous hosting of this event. This entry was posted in Resources, SJC Advisory Committee on February 17, 2019 by Pamela Schwartz. This entry was posted in Meeting Minutes, Secure Jobs News, SJC Advisory Committee on January 13, 2019 by Pamela Schwartz. MGM/STCC English Language training for PR evacuees: Info sessions on May 9, 10 and 11. Trainings from May 15 to May 31. For more information, click here for the English language flyer; and click here for the Spanish language flyer. This entry was posted in SJC Advisory Committee, Training on May 10, 2018 by Pamela Schwartz. Pamela Mendes and Christine Ventulett-Buckley, employment liaisons for the Western MA Employment Collaborative, shared information about their program and what they offer. Formed 3 years ago in Western MA with funding from DDS and DMH (there are 6 collaboratives statewide), it provides resources for job developers in the region (e.g., career centers) and businesses, supporting employment efforts for disabled individuals. The criteria for disability is very widely defined, physical or mental illness and does not require particular documentation. Pamela and Christine run a job developers networking meeting that meets bi-weekly. Contact either Pamela at pmendes@riversidecc.org or Christine at cvbuckley@riversidecc.org to get connected! Pamela provided an update on the planning for the Network’s second annual Homelessness Resource Fair for Providers that is taking place on Thursday, June 14, 9:30 am – 12:30 pm at HCC. Last year over 200 people attended. The Fair will offer a series of workshops on various topics, including career services (led by career centers). Stay tuned on receiving further notice and registering for either table space or as a participant. The group discussed the increasing challenge of lack of ESOL – wait lists as high as several hundred – and how this shortage is adding significantly to employment barriers to non-native English speakers. It was noted how language training is increasingly being linked to particular job skills (e.g., learning English for cooking or for health care positions). It was agreed that the lack of language learning resources is fundamentally a funding issue and that we need to learn more about the advocacy statewide and meet with our state legislators on the issue. Lisa will follow up with Center for New Americans to get some additional insight on statewide work. Pamela will reach out to Senator Lesser and Representative Vega to begin to schedule a meeting with our legislative delegation. Alyce of GCC also noted the disconnect around the under-enrollment of ESOL classes at GCC and the resulting reduction/consolidation in classes that is happening. Will investigate that further to see how gap can be closed. National emergency grant to assist PR evacuees has been approved for all the career centers and resources are now available to to provide training and other employment support. Youth with disability program, serving youth ages 14 to 24, is available at career centers – providing career pathways and support. Contact any career center for more info. Learn to Earn: Commonwealth Corp funded collaboration with GCC, HCC, career centers, hospitals – recruitment will start shortly for a pre-training program that will take place this summer for 6 weeks. The people who complete it will be enrolled in a 9 month medical assistant program and earn national certification. Mostly online learning with weekly classes at HCC; transportation and child care are provided. Eligibility criteria: must be a recipient of either TAFDC, SNAP, WIC, day care voucher or Mass Health. Contact career centers for more info. This program is designed as a direct response to the “cliff effect” challenge. Next meeting: Wed., May 9, 3 pm – 4:30 pm, HCC. This entry was posted in Meeting Minutes, SJC Advisory Committee on April 13, 2018 by Pamela Schwartz. Career Centers Meet Network: Congratulations to all! 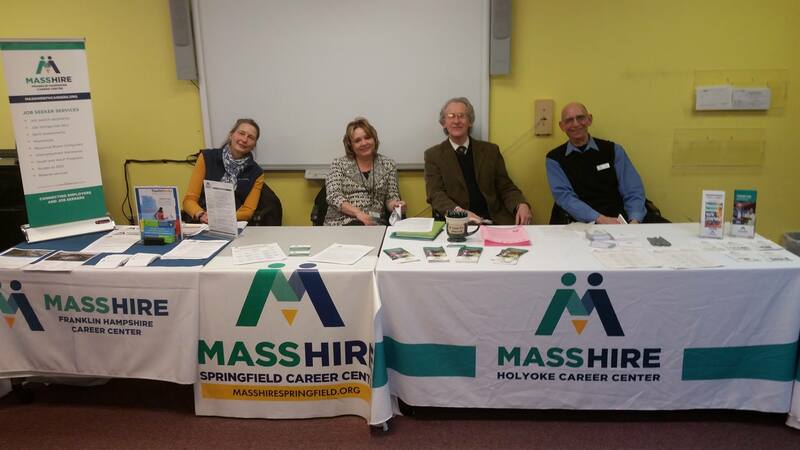 Yesterday afternoon at Holyoke Community College, 75 people attended a Network sponsored Career Services Training to learn about employment related resources available for people at risk of or experiencing homelessness. Special thanks to every Career Center in our region, as well as Way Finders’ Secure Jobs Program, for providing such an excellent training, especially to: Bud Delphin, CareerPoint, Lisa Lapierre, Franklin Hampshire Career Center, Maegan Pedemonti, Way Finders Secure Jobs Program, Konrad Rogowski, FutureWorks, and Pamela Wojtkowski, BerkshireWorks, all of whom participated in an excellent presentation. Stay tuned for the materials in an upcoming blog post. And thanks to our Network partners who really brought home what it is to be a Network: from housing to health care to child care to domestic violence services to sheriffs’ offices to the Veterans Administration to multiple state agencies, almost every sector of our community across our four counties was represented in that room, all joined in the mission to make permanent housing a reality for all in Western Massachusetts. Finally, a big thanks to Holyoke Community College for receiving a last minute call for space as a result of unanticipated overflow in numbers for our initially reserved space. HCC provided us the beautiful Kittredge Center space in an instant. We are so grateful for the partnership. This entry was posted in SJC Advisory Committee on November 16, 2017 by Pamela Schwartz. Progress Report: The program met its own internal goal of 100 job placements in FY17. Fantastic work! Congratulations! Click here for further breakdowns. Maegan will be updating the housing retention data for FY17 in the next few weeks. Rep. Vega suggested breaking out the data to compare the housing outcomes for families who receive HomeBASE or shelter without Secure Jobs assistance and those who do, i.e., the difference Secure Jobs makes. Maegan said she can pull that out in her analysis. We also discussed the value of more closely understanding the breakdown between full and part-time employment; the numbers who began in part-time and evolved to full-time; and/ the numbers who needed to work only part-time in order to avoid the “cliff effect” (loss of other benefits with too much income). Rep. Vega underscored how valuable it would be to collect data regarding the cliff effect and how it impacts the people the program serves. We will check back in on this data at our next meeting. the Disability Employment Institute for youth ages 14 -24 years. It is a 3 year grant, in partnership with FutureWorks, that provides a wide range of services to a wide range of individuals (it is self-attested disability). Bud also reported on the increased collaboration between CareerPoint and FutureWorks, including a regional approach with businesses, the creation of a regional talent bank, and a shared triage process to determine job readiness and best matches for available positions. This is a great development! The Conference Committee completed its budget and unfortunately cut funding for Secure Jobs from $800,000 last year to $650,000 in FY18. The budget now awaits the Governor’s signature or vetoes. The budget also moved the program to DTA. Maegan reported her understanding that DTA was likely to apportion funding equally across all 7 programs statewide as opposed to on a performance basis (less advantageous to our program since we are a very high performer). However, despite this cut, Way Finders is leveraging its resources internally to keep the program intact and growing. A new employment specialist has been hired (internally) and they are now integrating RAFT, Stabilization and Secure Jobs in a way that maximizes the combination of workforce development and financial literacy skill development. The one clear consequence of this state funding loss is the lack of capacity to expand Secure Jobs funding in the Three County region. Also click here for the breakdown of the Conference Committee budget in relation to all Network priorities. Homelessness Resource Fair: The group exchanged on the success of this year’s fair and Pamela shared Holyoke Community College’s offer of space for next year. We have set a date: Thursday, June 14, 2018, 9 am – 1 pm. We will have the Kittredge Center’s multi-purpose room and 4 classrooms for break-out sessions. Hampden County training/resource sharing? Rep. Vega noted his attendance at a legislative breakfast offered at Way Finders where WF walked through all of its resources. He was very impressed and suggested that a similar sharing – with other partners – could be useful to people across the region. We discussed further and the group agreed to plan for a training/orientation in October. Pamela will follow-up after Maegan returns from vacation in early August and we will be prepared to talk further at our Sept. meeting and set a date for October. This entry was posted in Meeting Minutes, SJC Advisory Committee on July 13, 2017 by Pamela Schwartz.